Bill Le Boeuf Jewellers - Barrie, Ontario - misc. 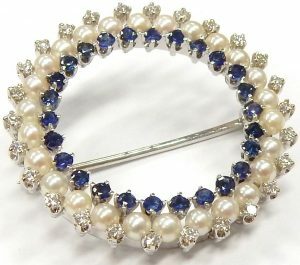 Pearl, diamond, and blue sapphire, the three timeless staples of jewellery combined into one vintage circle brooch. Each are unobtrusive and elegant, allowing them to be worn with anything. Even more so set into style neutral and barley visible 14 karat white gold. As modest dress is making a comeback the brooch is also seeing a resurgence as an accent at the center of a high, fastened shirt collar. A more polished alternative to a simple pendant laid over a blouse, the brooch centers the attention just above the collar bone, accentuating the neck. This 32mm diameter piece will make a graceful statement no matter where it’s worn. The perfect 0.50 carats of round brilliant cut diamond are a high VS-GH quality, throwing impressive fire despite their petite size. That brilliance transitions into the soft luster of the creamy white pearls and the deep blue tones of natural sapphire. Estate price for this vintage fashion piece $1200.00 CAD. Stock #e11921. Mikimoto is certainly the most famous name in the pearl world but in case you’ve never heard it we’ll catch you up. Mikimoto Kokichi was the eldest son of a poor family in early 1860s Ise, Japan. He was fascinated with the pearl divers searching for natural pearls from the ocean and made his way into the industry. After opening his own pearl farm in 1888 he worked tirelessly pioneering pearl culturing techniques. Natural pearls occur when an irritant gets trapped inside of the mantle of a mollusk. To protect itself from the irritant that the mollusk can’t remove it coats it with layers and layers of nacre. Starting with something as small as a tiny pebble or grain of sand means that natural pearls take years and years to form. Pearl diving traditionally meant harvesting hundreds of mollusks which were not forming pearls in the hunt for those rare few that were. When one was found that had produced a pearl the size and shape was completely random. 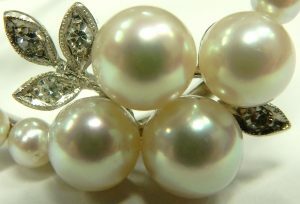 The demand for pearls in the late 1800s severely outstripped the rate at which they could be found naturally. Mikimoto and other pearl farmers developed the process of implanting small mother of pearl beads or nuclei into the mantel and returning the mollusk to the sea. By starting with this larger bead it took less time to get a pearl large enough to be drilled and strung. It also meant that you knew every mollusk in your farm was producing a pearl and when the optimal time to harvest was. As the culturing was advancing the beads also allowed the shape and size of the finished pearl to be dictated. Despite these innovations and increases in quality Mikimoto was having difficulties with consumers who misinterpreted cultured pearls to be fake pearls. To combat this he opened his first retail boutique and started producing his own pearl jewellery. 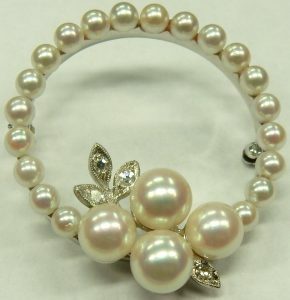 The brand took off and by 1935 Japan was producing 10 million cultured pearls annually. Today except for the occasional show piece, all pearls are cultured and Japanese pearls are the highest quality available. 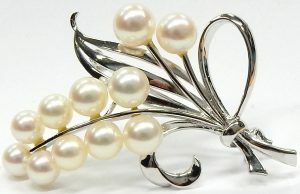 This vintage 1970s Mikimoto brooch, though made from sterling silver, exhibits the top quality the brand is known for. Each well matched creamy pearl displays sharp reflections of the world around it, an indication of nacre quality. 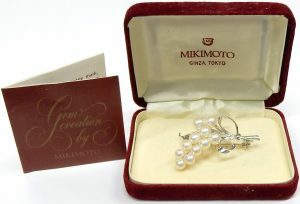 Accompanied by its original vintage box and Mikimoto brochure and care guide. Estate price for this history lesson $280.00 CAD. Stock #e11919. This 1.03 carat natural Colombian emerald packs a punch. It’s one of the nicer emeralds we’ve had through our estate department by colour intensity and clarity. 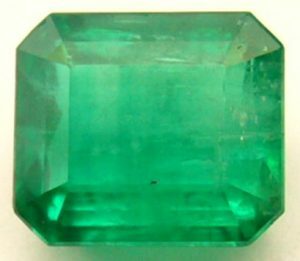 It’s been graded by Harold Weinstein Ltd. as strong bluish green and moderately included in the July 5, 2016 appraisal. Strong is the key word to describe the colour of green that this emerald displays. 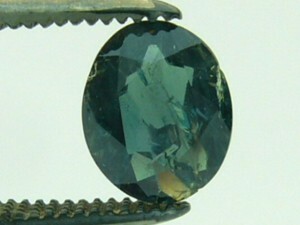 The grade setting inclusions run parallel to the main facets. They end up blending in nicely with the pattern of the stone allowing it to face up much cleaner than you’d imagine from the photos. 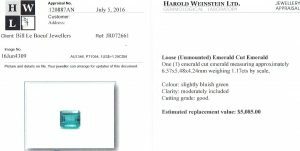 Weintstein gave the loose emerald an appropriate and accurate replacement value of $6,200.00 CAD. Our estate price $4,340.00 CAD. Stock #e9861. There’s an on going argument between our staff about small diamonds. Do they look better when they are a 17 facet single cut design or a modern 57 facet brilliant cut pattern. The brilliant cut adds more brilliance without question, but when diamonds are less than 2.0mm diameter can this be appreciated? One look at this 2.00 carat total weight 131 (single cut) diamond creation will convince you of the superior look of single cuts when it comes to small diamonds. I think the only manufacturer that is even using good quality single cut diamonds is Rolex. You can conceal many flaws and imperfections with a brilliant cut diamond but a single cut will reveal a poor cut and all inclusions. 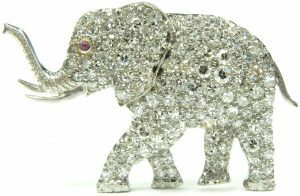 Crafted by a highly skilled but anonymous artist this cute little marching elephant weighs 6.1 grams including the VVS-DEF diamonds. The diamonds have been expertly bead set leaving almost no metal showing between the stones giving a continuous twinkle from trunk to tail. It looks great even from the back. 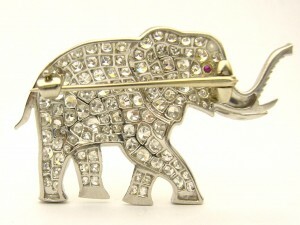 Perfect condition piece showing great detail especially around the truck and tusks with delicate hand engraved features. It’s hard to exactly date this item but we would estimate it to be from the 1930s. Secured by a locking pin hinge this item is ready to be used as a great example of wearable art. Estate priced at $3,430.00 CAD. Stock #e8702. A few simple stars. 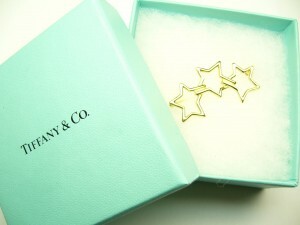 Amazing how the stylists at Tiffany’s can capture the feel of the 1980s with a three star outline brooch. If you are old enough to remember the 80s you will recognize this style as an iconic symbol of that era. This is a relatively rare brooch that I didn’t know existed until some research revealed its history. 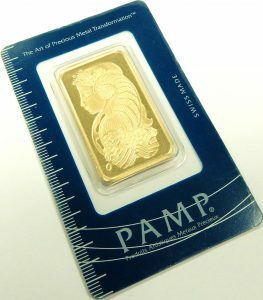 The 18 karat yellow gold brooch measures 42mm long and weighs 6.5 grams. The back has been stamped Tiffany & Co. 1986. This piece comes with that special little blue box too. Estate priced at $749.00 CAD. Stock #e7461. The 0.07 carat I1-I quality diamond in this antique brooch would have been quite a novelty in the mid 1920s when this piece was new. Marcel Tolkowsky, a Polish engineer who came from a long line of diamond cutters invented for his PhD thesis the perfect dimensions and facet angles to maximize a diamonds sparkle and brilliance in 1919. 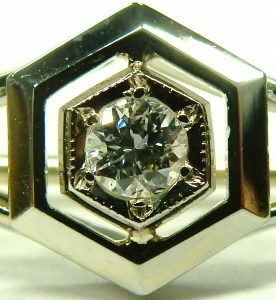 By the mid to late 20’s his cut was replacing old mine and old European cut diamonds all over Europe and North America. 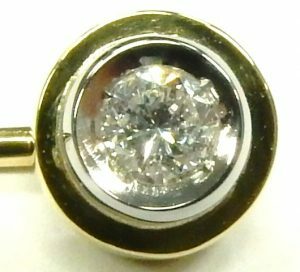 This 2.5 gram Art Deco bar pin that houses his then new ground breaking diamond cut is made with uncommon 19 karat white gold and features a hand made safety catch that was the precursor to the modern safety catch we use today. 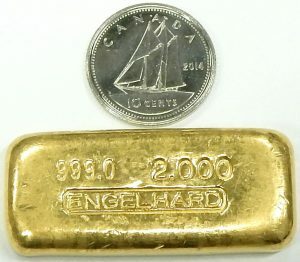 Estate price $420.00 CAD. Stock #e9734. If you can, you really need to visit Bill Le Boeuf Jewellers in person sometime. There is just no way we can possibly post every single estate item that comes in. There are 100s of really cool pieces that come and go without a single moment of internet fame. I thought this little ballet slipper needed to be shown. Somebody out there must have a dancer in there life that would just love this little 10 karat yellow gold slipper. 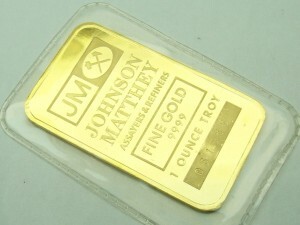 It is crafted from 1.1 grams of traditional yellow gold and measures 20mm (not including the jump ring). It can be worn on any type of charm bracelet or necklace. The back side is flat and highly polished, it can be engraved with a date or name for the extra touch of sentiment. Freshly polished and looking like new. 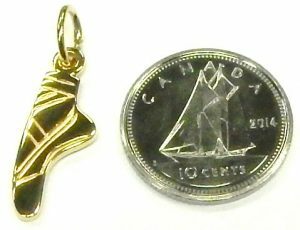 Estate priced at only $49.00 CAD. Stock #e10666. 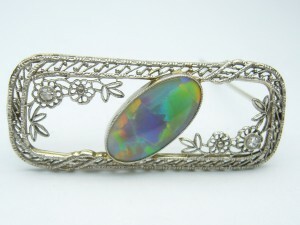 As brooches see gentle and delicate wear they survive the ages far better than any other jewellery item. Which is why this rectangular mosaic of delicate Art Deco craftsmanship looks brand new despite being almost 100 years old. The statement piece measures 46.8mm long by 19.75mm wide. It’s decorative face is made from ever-white platinum which is to thank for the delicate detailing that only platinum can hold. Being a softer metal that top was reinforced with an extra strong 18 karat white gold gallery. The brooch is all timeless elegance accented with 0.57 carats of antique cut SI-H quality diamonds and 0.33 carats of custom cut bright blue sapphires. It is secured with an 18 karat white gold hinged pin and antique locking catch for extra security during wear. 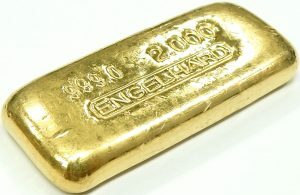 The 11.2 gram antique is one of a kind and certainly earns its estate price of $2,520.00 CAD. Stock #e11688. The 1930s saw the tail end of the Art Deco movement and the beginning of innovation in platinum. The invention of the oxyacetylene torch in 1903 with its impressive heat output, allowed jewellers to manipulate platinum in ways they’d never been able to before. Platinum being so much tougher than gold meant jewellers were able to make pieces that were unbelievably delicate and airy without compromising strength. Meaning of course that pieces could be made much larger without much additional cost, which came in handy during the Great Depression of the 1930s. 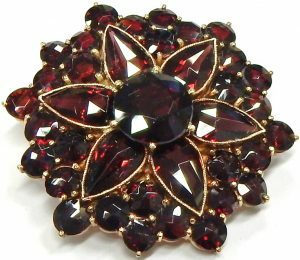 Brooches like ours (measuring 59.0mm long x 20.4mm wide) became the height of fashion and were used to add form and adornment to the loose, flowing dresses of the decade. The feature of our 4.2 gram platinum and 14 karat white gold piece is a bright 0.10 carat old European cut diamond shouldered by top quality, custom cut sapphires. 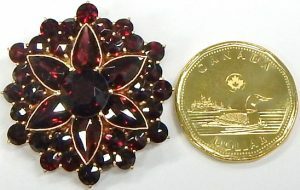 Estate price for this estate brooch $903.00 CAD. Stock #e10133. 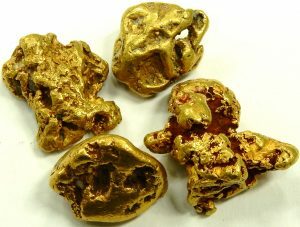 Much more rare than diamonds and only mined in a few locations in the world. 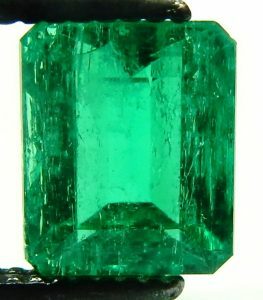 There is not another gemstone that has the same soothing green colour that high quality emeralds exhibit. This Columbian one measures 7.50mm x 6.53mm x 4.73mm and weighs just shy of 2.00 carats. On a scale of 1 to 10 I would grade this one a 6. It has really nice colour and good clarity. 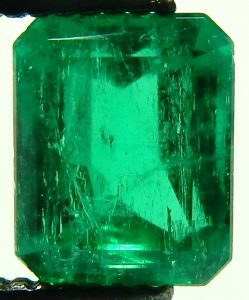 It does show some eye visible inclusions but virtually all emeralds do. 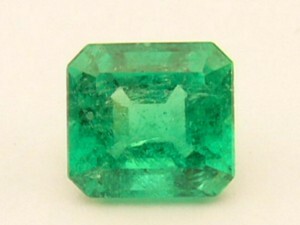 A perfect emerald of this size can easily sell for more than $15,000.00. 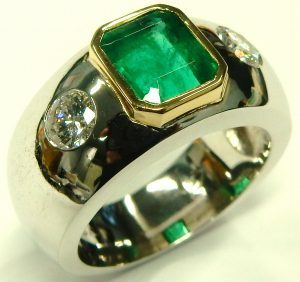 We’ve set this emerald into one of our custom made rings have a look here to see what we’ve done. Estate priced at $2,800.00. Stock #e9755. At what point does jewellery become fine art? Art is something difficult to define or describe but you know it when you see it and this is it. Hand made from 18 karat rose gold this creation is so much more than just a brooch with a ton of bling. The trio of three dimensional flower blossoms have depth and shading executed as well as anything done by a great artist or master sculptor. Close to 1000 fancy coloured champagne to chocolate brown diamonds have been expertly set showcasing the subtle colour details of spring blooms. The SI1 to I1 clarity diamonds are graduated in size from 1.3 to 1.5mm diameter to fit the unique requirements of each petal. I can’t imagine the time required to just simply sort through the piles of stones in order to pick out the right ones that are correct in hue and size. Black rhodium plating within the petal borders provides extra contrast against the sparkling diamonds. It’s too bad this piece has gone unsigned lacking even a visible trademark. Someone with the type of talent required to make a brooch like this shouldn’t be kept a secret, but I guess they prefer to remain anonymous. 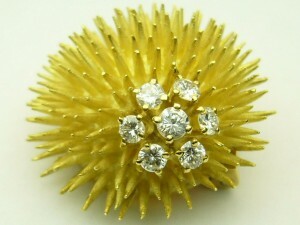 A brooch of this quality, size and design will instantly become the centre of attention at your next event. 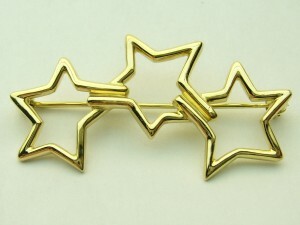 Measuring 5.6cm x 5.7cm it would look amazing on a dark colour dress, jacket or blouse. 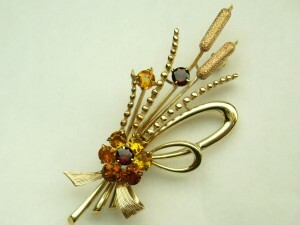 In close to 60 years buying and selling new and estate jewellery we have never seen a brooch like this before. While we are more than qualified to supply an appraisal of value on an item like this, we thought it would be a good idea to get a respected independent opinion of value assigned to it. 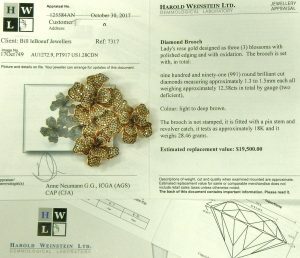 Included with purchase is an October 30 2017 appraisal document from respected jewellery appraisal company Harold Weinstein Ltd. Their assessment of $19,500.00 plus tax doesn’t seem out of line considering all the components and labour involved in creating this work of art. 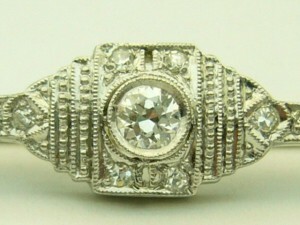 As a one of a kind estate item in like new condition we have it priced at just $12.79 per diamond or $12,675.00 CAD. Stock #e10824. 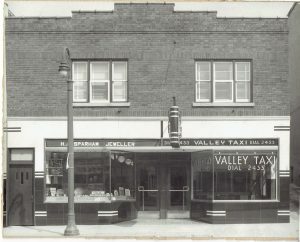 It’s been 60 years (to the day) since my father purchased this business from the original jeweller who occupied the space at 52 Dunlop Street West from 1940 to 1958. 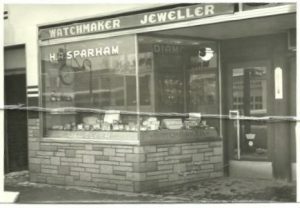 Herbert A. Sparham left behind some optical inventory and tools in addition to jewellery plus watchmaking equipment. 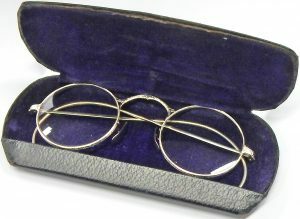 It was common practice in the early part of the 20th century for jewellers to also supply basic optician services too. While Bill Le Boeuf Jewellers never did any work in the optical field I bet I could still find some old glasses and parts in our basement if I looked. These solid 14 karat white gold frames with non prescription lenses are a fitting tribute to this stores history before it became Bill Le Boeuf Jewellers November 1st 1958. They are solid 14 karat white gold and weigh 11.5 grams not including the currently fitted none prescription lenses. While we don’t know much about luxury eye ware, the construction technique of these are very similar to a fine piece of jewellery. 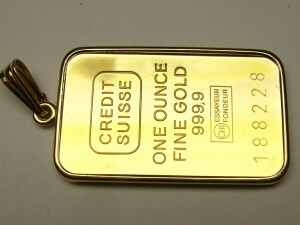 A jewellery item made to the high standard of the frames with a similar weight could easily cost $1500.00, especially if it came from a high end designer. From the design and beautifully hand engraved details we’d estimate the pair was made sometime in the 1930s. The exact history of the pair is unknown as they came in on trade a few months ago. Their condition is basically perfect. They’ve likely been sitting undisturbed in what looks like the original velvet lined hinged case for more than half a century. The none prescription glass lenses are also in perfect scratch free condition. Whether these were a salesman’s sample or they were only occasionally used by someone as a fashion statement, we’ll never know. 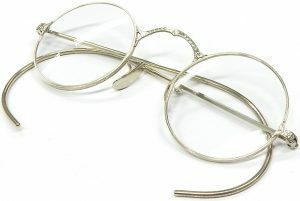 They’re really cool and deserve to be used by someone who appreciates luxury eye ware and high quality construction. Unlike modern glasses if something breaks on these, a skilled jeweller can always repair them. Obviously these are a one of a kind item for us and come along only every 60 years. 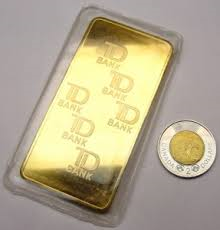 Get them while you can because priced at $495.00 CAD they offer amazing estate value. Stock #e11702. 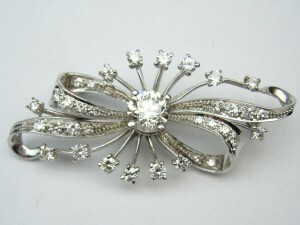 If we had any say in it brooches would be as popular now as they were when this antique Birks piece was made. Measuring a statement making 38.9mm in diameter the medallion sized piece would have been a prized adornment. It is covered all over in custom cut deep red garnets that flash a plum colour at the slightest movement. 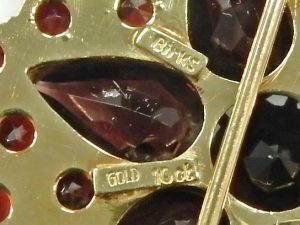 Together the 37 natural garnets equal an estimated 24 carats all set in warm 10 karat yellow gold. The antique hinged pin has a clever locking clasp for added security during wear. 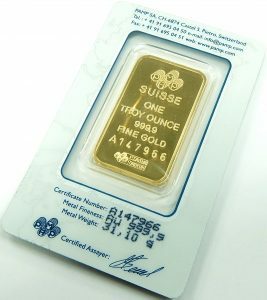 Estate price for the 11.8 gram piece $840.00 CAD. Stock #e11687. Only a master jeweller and expert carver could collaborate to create an amazing piece such as this. I’ve always admired those who can carve a beautiful object from something like stone or in this case a natural shell. Drawing a portrait or painting one for that matter is all about adding detail and making corrections as you go. Carving is all about removing material until you’re satisfied with the results. There’s no going back to cover a mistake with a carving. Dealing with a thin fragile shell of a mollusk adds to the challenge. 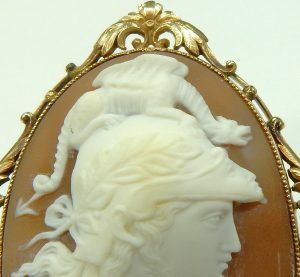 This beautifully carved cameo is less than 1.5mm thick in spots. The details in its depiction of a Roman soldier is amazing considering the cameos dimensions of 42.0mm x 28.5mm. The details extend to the finely crafted 14 karat yellow gold handmade frame that secures the cameo. I imagine securing the delicate shell carving in the bezel setting wasn’t something the jeweller looked forward to doing. This great example of a traditional jewellery item looks to be 100% original. We didn’t even polish it. We though the original oxidation and patina looked perfect and suited this beautiful item. This variety of jewellery is truly what wearable art is. 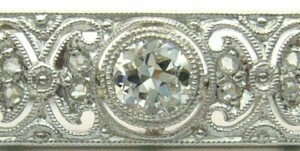 The entire brooch weighs a substantial 16.6 grams and is secured by a folding pin clasp with safety. We don’t see them this nice very often and we’ve never seen this exact subject matter before with the image of the dragon on the soldiers helmet. 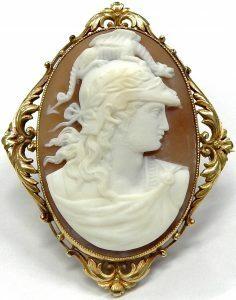 This one of a kind cameo is as good as they get and is estate priced at $630.00 CAD. Stock #e11015. If you have a few automatic watches you know that it can be a pain to keep them all running on time with the calendar showing the correct date. The benchmark in winding box technology is Orbita. 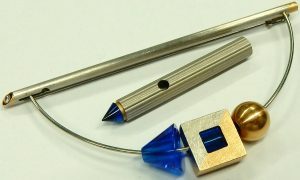 For over 20 years these American made watch accessories have been the choice for those who appreciate the high quality and trouble free reputation Orbita winders have earned. In the last few years lots of less expensive watch winding devices have come to market. We’ve tried some of these offshore manufactured machines and they do not compare. Orbita products run silently and the finish of the wooden cases are second to none; they’re now the only brand we will sell. They are beautifully finished with top notch hardware. As official agents for many years we have never had to exercise the warranty due to a mechanical failure. This example was purchased new from Bill Le Boeuf Jewellers a few years ago. The Sparta 2 Deluxe is still offered but is no longer available in the black polished piano finish. It is only offered in a brown burl or teak and is priced at $795.00 USD. This black example is in very good condition showing only a few shallow surface scratches. It comes complete with the original green outer box and protective foam lining. Estate Orbita winders almost never come in and I don’t expect this one to last too long. Running like new with fresh batteries included. Estate priced at $500.00 CAD. Stock #e10640. 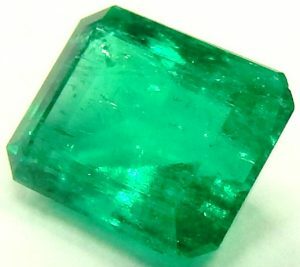 A loose emerald can be a wonderful place to start building a unique and thoughtful piece of jewellery, and our designers would love to build it with you. Whether they’re remaking your favorite Tacori inspired design (without the cost of the Tacori name brand) or finding a way to capture the personality of your loved one in gold and diamonds they’re here to help. Let’s see what they can create with this 6.57mm long by 5.48mm wide 1.17ct natural slightly bluish green emerald cut emerald. The beautiful gem is accompanied by a July 5, 2016 Harold Weinstein Ltd. jewellery appraisal with a replacement value of $5085.00 CAD. Estate price $3500.00 CAD. Stock #e9862. 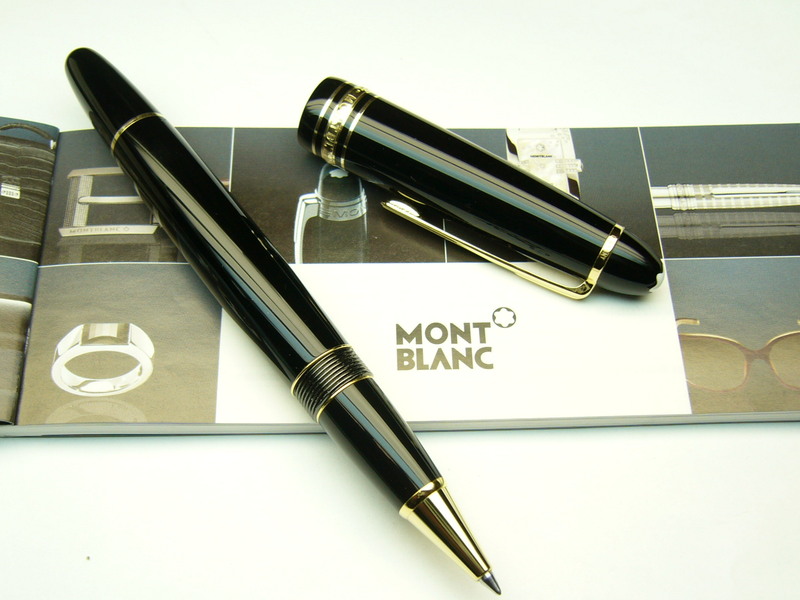 MontBlanc’s Meisterstuck line of writing instruments are an unbeatable gift for the professional that has it all. Ranging in price from $425.00 up to $4000.00. Our never used Rollerball LeGrand falls into the medium range of the line, with a suggested retail price of $630.00 USD. Model 7571 is one of the lines most universal styles made from glossy black resin and platinum coated details. 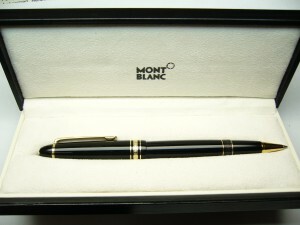 The luxury pen was purchased at the very end of 2013 at a Toronto authorized MontBlanc dealer and is accompanied by it’s original box, sleeve, and paperwork. 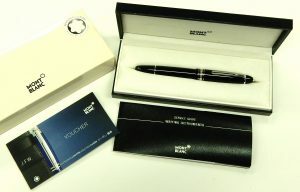 Included with purchase is a Montblanc no charge engraving voucher. Brand new, never used condition the Meisterstuck is estate priced at $550.00 CAD. Stock #e10065. 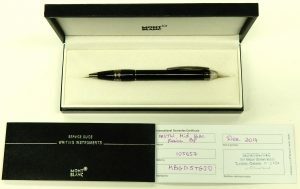 MontBlanc Starwalker Midnight Black ballpoint 105657 $280.00 CAD. The combination of sleek German engineering and modern design in MontBlanc’s Starwalker line makes the line one of their most striking and robust. The Midnight Black model from the Starwalker line is made from glossy black resin and stainless steel plated with tarnish proof, gun metal grey ruthenium. That rarer metal from the platinum group comes in very limited quantities from Russia, South America, and oddly enough Sudbury, Ontario. To top off the unique composition of model 105657, MontBlanc has tipped it with a floating version of their emblem suspended in clear crystal. Viewed from the side that iconic, softly curving emblem hints at the outline of the mountain peak it symbolizes. This luxury writing instrument is in brand new condition, accompanied by its original box and manual with warranty dated from December 2014. With a replacement price of $340.00 USD our midnight black is a steal for the estate price of $280.00 CAD. Stock #e10279. 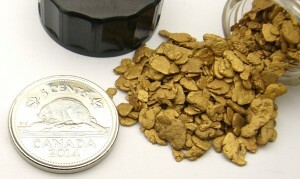 14kt. 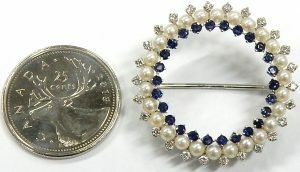 white gold high quality Akoya pearl & diamond brooch $700.00 CAD. 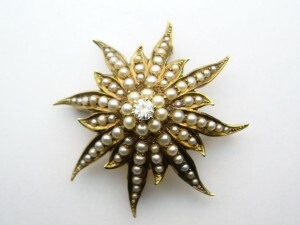 A brooch is the perfect place for pearls especially when they’re this nice. The hardness of pearls can range from 2.5-3 on the MOHS hardness scale meaning anything from other jewellery to a coin or knife can easily scratch the nacre off the surface. This softness means that pearl rings and bracelets are not meant for daily wear and need to be worn mindfully. These well matched, perfectly round Akoyas with their soft blush overtones and high luster will be well protected from harm perched proudly on a scarf, jacket, or blouse. The 24 pearls measure from 3.5mm to 6.8mm diameter. The brooch has some additional detailing with four millgrained 14 karat white gold leaves set with sparkling single cut diamonds. All together it weighs a sturdy 8.1 grams, measures 32.50mm in diameter and is secured by a pin hinge with safety clasp. Estate price $700.00 CAD. Stock #e9726. Antique 14 karat gold amethyst brooch by Ryrie $420.00 CAD. The name Ryrie may not sound familiar, but who they were acquired by likely is. In the later part of the 1800s Ryrie Bros. operated out of a small downtown Toronto store. They flourished expanding several times into a very high end successful business. Ryrie merged in 1905 when Montreal jeweller Birks decided to open a competing store only 4 doors up from the Ryrie location on Young Street. This beautiful brooch is made from 4 grams of traditional 14 karat yellow gold. In perfect condition showing no wear of any kind. 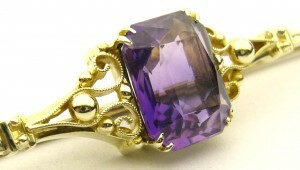 Measuring exactly 2.5 inches long the pin contains a 2.5 carat natural scissor cut amethyst. It’s a great period piece that displays excellent examples of filigree and milgrain. 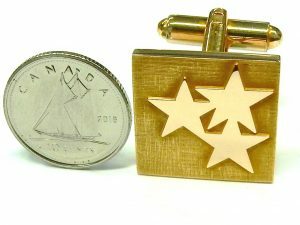 This little piece of hand made Canadian jewellery history is estate priced at $420.00. Stock #e8839. 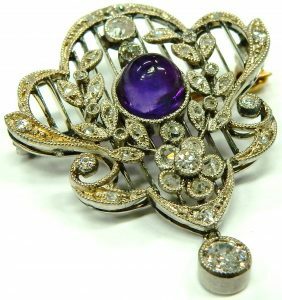 Antique platinum amethyst & diamond brooch 0.50ct. $770.00 CAD. 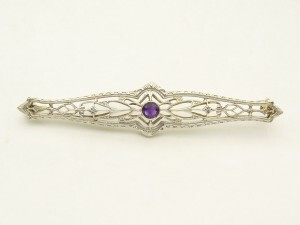 The Edwardian jewellery movement existed in parallel with Art Nouveau at the beginning of the 20th century. 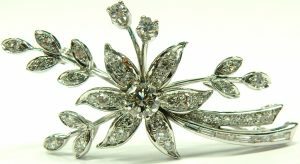 Where Art Nouveau focused on nature and the female form for inspiration Edwardian jewellery looked to the 18th century aristocracy for inspiration. 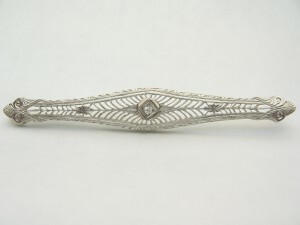 The movement is characterized by its use of delicate lace work, garlands, and ribbons encrusted in diamonds and edged by millgrained platinum (a brand new technique at the time). This delicate, handmade brooch is in remarkable condition considering it’s over 100 years old. The focal point of the intricate piece is a cabachon cut amethyst, a favorite gem of European royalty and typical choice of the movement. Of course the brooch is also adorned by an estimated 0.50 carats of antique rose cut, old mine cut, and old European cut diamonds. Bridging the entire evolution of the modern round brilliant cut diamond in one piece of jewellery. 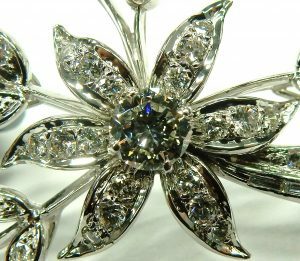 The largest of those diamonds hangs freely at the bottom of the brooch, adding a touch of eye catching movement. 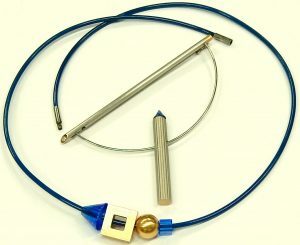 The pin and catch are made from warm yellow gold and feature an ingenious tension lock for unparalleled security. If you don’t have much use for a brooch the piece can be converted to a pendant at a small additional cost. 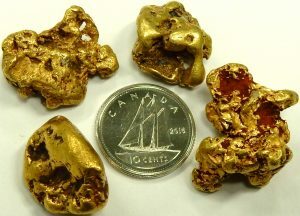 Estate price $770.00 CAD. Stock #e9999. Hand made silver & agate road runner figurine 3 1/2 inches tall $150.00 CAD. Art Deco 14 karat diamond brooch $560.00 CAD. 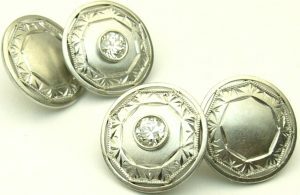 These Art Deco brooches were very popular almost 100 years ago and many have survived in great shape because of the way they had been worn. 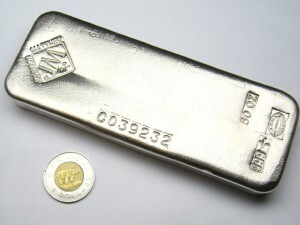 This example measures 68mm long and is made of 4.0 grams of 14 karat white gold newly developed during the first world war. It is beautifully decorated with a pierced filigree design in fantastic condition with a small 0.04ct. diamond bead set in the centre. Estate price $560.00. Stock #e4873. 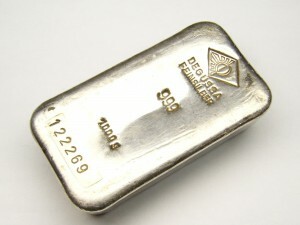 Platinum & 14kt. 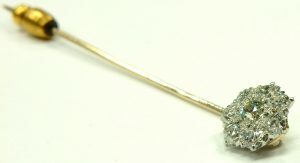 yellow gold 0.50 carat 1920s stick pin $630.00 CAD. 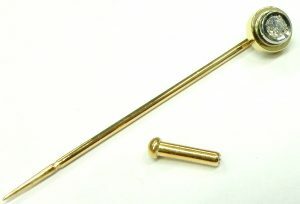 I recently saw an interesting article in a watch magazine about a new trend in men’s stick pins. Worn alone or in twos or threes diagonally across the breast pocket of suit jackets instead of, or in addition to a pocket square. I don’t know if that style will filter into Barrie but I thought it was an interesting new trend for such a traditional style of jewellery. 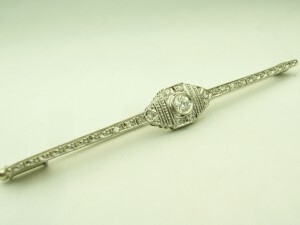 This vintage stick pin is from the 1920s and has the diamonds to prove it. 8 old European cut diamonds in fact that were cut around 100 years ago. All the diamonds are of very bright VS-SI-GH quality totalling an estimated weight of 0.50 carats. With the brilliance only old European cuts can give, this stick pin will be a sparkling accent for someone’s scarf, lapel or perhaps, a trendy jacket pocket. Estate price $630.00 CAD. Stock #e9508. Vintage diamond brooch 1.67carat VS-GH 8.4 grams 18 karat $5194.00 CAD. The late 1940s moving into the 1950s was the era of diamonds. The war was over and North America was seeing new prosperity. DeBeers debuted their new slogan “Diamonds are Forever” in 1948. Marilyn Monroe was on screens all over the world the following year singing “Diamonds Are a Girl’s Best Friend”. For the first time people were wearing diamonds during the day; etiquette had previously dictated diamonds to be evening wear only. Floral and animal motifs were all the rage thanks to Jean Schlumberger’s playful designs for Tiffany & Co. This brooch was the height of fashion at the time and thanks to widespread prosperity it was hand made from top quality materials. 8.4 grams of 18 karat, exceptionally white gold set with an estimated 1.67 carats total weight of VS-GH round brilliant and baguette cut diamonds. The substantial centre diamond alone weighs in at 0.56 carats. To say they don’t make them like this anymore would be quite an understatement. Estate price $5194.00 CAD. Stock #e9719. 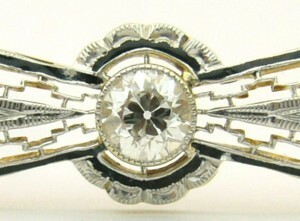 Art Deco platinum and 18kt. 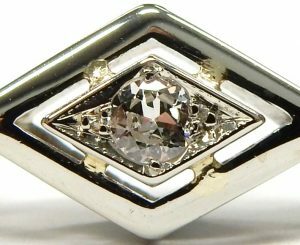 white gold diamond brooch $2100.00 CAD. At what point does a piece of jewellery become a work of art? I suspect it’s well before this. I can’t imagine better example of incredible Art Deco design. Estate pieces like this only come around once in a while and are never repeated. The skill needed to create an item like this is just not seen anymore in this world of computer aided design, 3D printing and simple casting. You could never get this kind of detail and personality with such sterile technology. 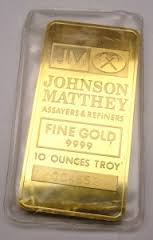 Making something like this is more like sculpting in precious metal. Beautiful bright cut metal from an engravers tool, the tiniest milgrain border along every edge, super fine saw piercing has the geometric elements appearing to float within the design. If you simply value such an item by adding up the sum of the parts the point of this object will be lost to you. Just like you can’t value a Picasso by the amount of paint used. A piece like this on a jacket, coat or blouse can be a most sophisticated look. 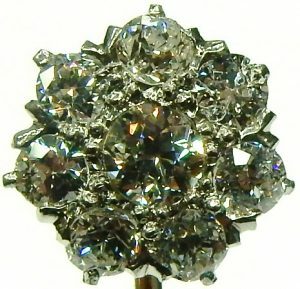 All 31 of the antique European cut diamonds are original and of excellent VS-FG quality. Total estimated diamond weight 0.66 carat. As outlined above the finest craftsmanship was used to assemble this pin using over 6.5 grams of platinum on the front seamlessly soldered to an 18 karat white gold back and hardware. 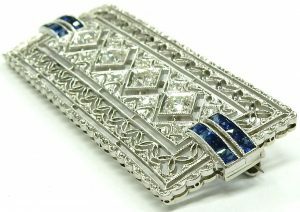 20 rectangular calibre cut synthetic sapphires provide the dark blue contrast that is important to all Art Deco design. Wearable art; all jewellers should strive and be inspired to create precious items that do more than just hold a few twinkly little gems. This irreplaceable item is estate priced at $2100.00 CAD. Stock #e9379. 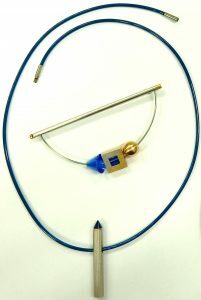 SOLID gold 14 karat CROSS ball point & fountain pen set $1600.00 CAD. Solid gold writing instruments have got to be considered one of the most luxurious items around. A quick surf over to the Cross website confirms this as they are offering the same style ballpoint pen in 18 karat gold for $3150.00 USD. The fountain pen is slightly thicker and heavier so it must have been worth even more when new. Both pens are in great original condition not showing any evidence of previous refinishing, no dents, no dings, no scratches. The Fountain pen appears to have run a cartridge or two through as the nib has some dried ink residue on it that should be removed before use. They come complete with all the original packaging, instructions, lifetime warranty, ink well insert and replacement ink cartridges all in like new condition. The art of cursive writing is disappearing with every new electronic communication device our modern lifestyle seems to demand. Wouldn’t it feel good to slow down just for a few minutes and write someone a thank you letter or birthday card with one of these pens. Don’t you feel just a little more special when you receive a hand written letter? 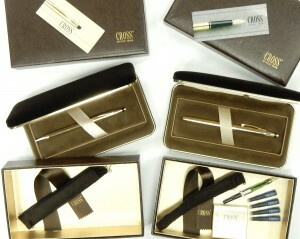 CROSS are America’s oldest manufacturer of writing instruments producing products since 1846. These pens are one of their most enduring designs called the Classic Century. 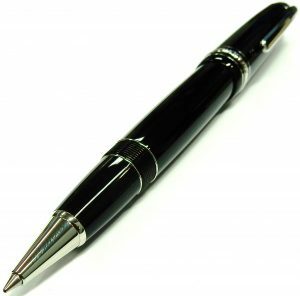 The style debuted in 1940s as a fountain pen only. 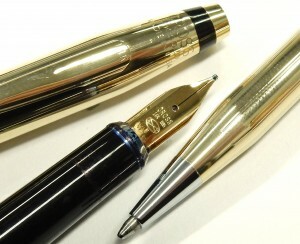 The ball point design followed in the 1950s. They are priced as a set for $1600.00 CAD or individually for $1000.00 each. Stock #e9407. 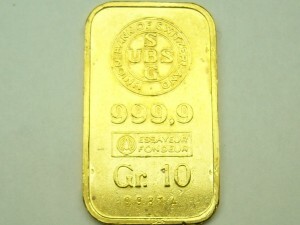 1920s 18Kt. Art Deco Stick Pin Ryrie $350.00 CAD. Sometimes some of the simplest designs are the most beautiful. 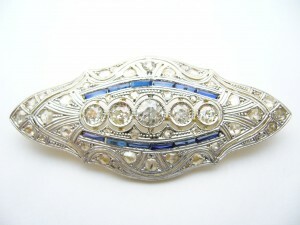 The Art Deco design period produced some of the more interesting and beautiful jewellery pieces. They have become very popular today among collectors. Craftsmen from the period used symmetry and geometric patterns quite often. This is a great example of the type of jewellery seen. 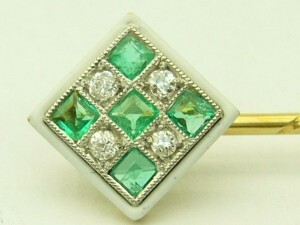 This 18 karat yellow and white gold stick pin contains 5 high quality square emeralds and 4 of the smallest full cut European cut diamonds I have ever seen. The diamond shaped checker board pattern is edged by a white enamel border. Made by Ryrie brothers which later became BIRKS. 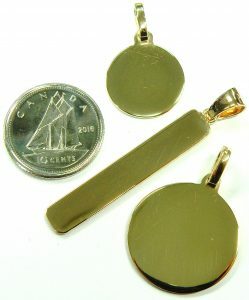 Ryrie brothers had a well earned reputation of producing some of the highest quality jewellery in Canada. 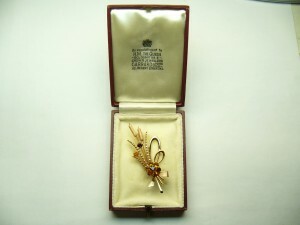 The pretty little stick pin measures 8.5mm x 8.5mm is estate priced at $350.00. Stock #e7526. 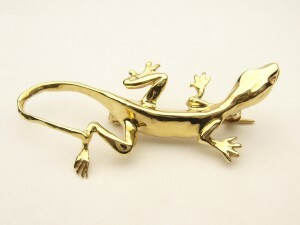 Here is a cute brooch made from 14K gold weighing 4.6 grams. It is secured by a pin back with safety lock. Estate price $350.00. Stock #e6042. Tiffany items always are of interest with our customers looking for estate jewellery but Tiffany does more than just jewellery. When it comes to luxury items, Sterling silver flatware is also one of their specialties. The first time I saw this knife I was a little puzzled and wondered what specifically it was designed for. Most sterling silver knives have blades made from some kind of steel and most serrated blades do not have a defined cutting direction. This turn of the century Tiffany knife is entirely made of sterling silver including the blade; also the teeth in the blade are designed to cut in a pushing direction. After a little research its purpose was discovered. It’s a fruit knife. One side of the knife is designed to cut through fruit and the other moderately sharp edge is designed to slice or peal the fruit. The 52.7 gram knife was designed for Tiffany by Paulding Farnham. The award winning designer worked for the esteemed firm beginning in the late 1800s. The knife is one of his more popular patterns and depicts designs made in the Italian renaissance style. The beautiful pattern is in original condition. The knife hasn’t been polished or refinished, just cleaned. Good original condition showing some wear associated with use and age. 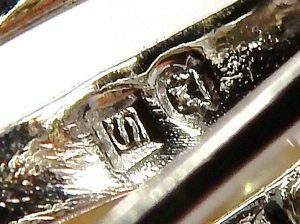 A small discreet engraving reads “N.Y. May 19-1913” can be seen on the side. 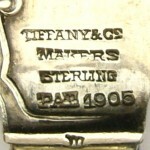 This is a interesting item and would make a great gift for a lover of Tiffany items. Estate priced at $210.00. Stock #e8592. 10 karat rose gold thimble $210.00. From the “now I’ve seen everything file” we offer a fully functional regulation size solid gold thimble. I’m not sure if this is a production piece or a hand made one of a kind creation, but the next time you have to sew a bottom on you can do it in a most stylish manner. The thimble is made from just over 5 grams of 10 karat rose gold. The soft pinkish colour is very pretty and gives this item an antique character. Think of what a great gift this would make for someone who dabbles in hand made clothing, needle crafts or tailoring. Just one example of some of the unique curiosities that come through our extensive estate department. The condition is very good only showing a few minor scratches that can easily be polished away in a few minutes if you like. Estate priced at $210.00. Stock #e8480. 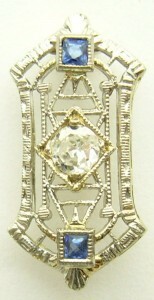 Great example of an Art Deco filigree and enamel diamond brooch. The black enamel border contrasts very well with the thin seam of white gold laminated to a yellow gold backing. A good quality 0.23 carat VS-H European cut diamond has been bezel set in the centre of the symmetrical design. A fine Greek key pattern with mill grain and engraved highlights are a few of the artistic elements incorporated in to bow shaped brooch. 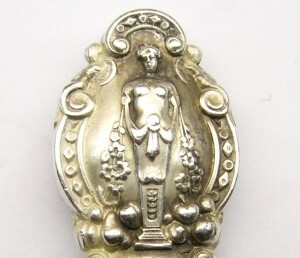 The brooch measures 45mm long with a weight of 3.1 grams and is in excellent condition. A locking pin hinge clasp should secure this pin for the next few generations to enjoy. Estate priced at $770.00. Stock #e8459. 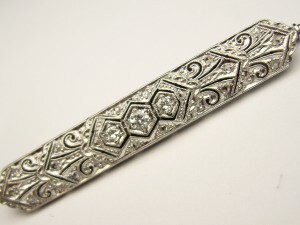 A perfect example of filigree from the Art Deco period circa 1920. 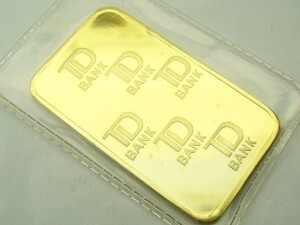 This example measures 54mm long and is made of 14 karat white gold front laminated to a yellow gold back. In the centre is bezel set one small natural amethyst. 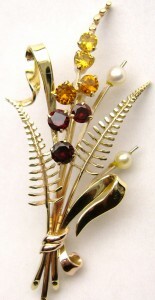 The brooch is secured by a pin hinge with safety. Estate price $343.00. Stock #e6123. This is an early Art Deco piece from around 1915. It is an exceptional example of a black opal. 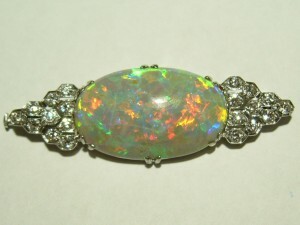 The cabochon cut opal weighs approximately 1.90 carat and has the best play of colour I have ever seen come through the doors at Bill Le Boeuf Jewellers. It measures 15mm x 8mm and shows broad patches of green/blue/orange and red. The colours are not uncommon but the size of the display of individual colour is exceedingly rare. The two pictures are only taken a few degrees apart and notice how some of the sections have completely change colour. If ever there was a stone that needs to be seen to be appreciated this is it. The 14 karat white gold setting also is of great quality made with very good quality filigree work around all four sides. Two small diamonds 0.03ct. each complete the package. It’s almost impossible the put a price on this item as it is certainly not replaceable. This type of jewellery usually is only seen in books or museums. Estate priced at $2580.00. Stock #e6156. Here’s a great summertime piece of jewellery made by Canada’s leading high end jewellery chain Birks. 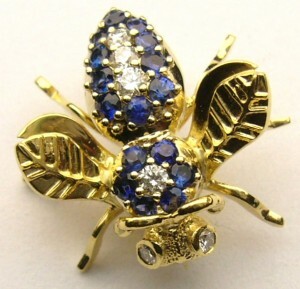 The cute little bee measures 16.5mm long and weighs 3.4 grams. The body has been expertly decorated with 4 high quality round brilliant cut diamonds and 16 round faceted medium blue sapphires also of high quality. Two additional bezel set diamonds make up the eyes. 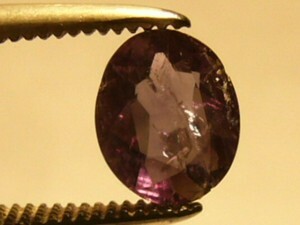 The total gem weight is estimated to be 0.35 carats. 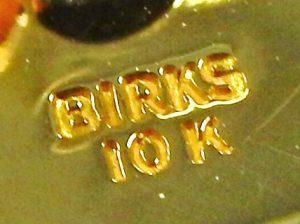 The BIRKS logo of back to back B’s is stamped on the back of a wing. A sturdy locking pin hinge will secure the brooch to your lapel. If you wish this item could be easily modified into a pendant for use on a necklace. Perfect condition looking like it has never been used. Estate priced at $525.00. Stock #8342. Of all the various art forms out there sculpting and carving has got to be the most difficult. When carving it’s not about adding material to create an image, it’s about taking away everything that doesn’t look like the image. If you cut too deep or take away too much there’s no going back. A hand carved cameo brooch like this goes one step further using the various different layers of colour. The artist’s ability to use these layers to create the effect of shading and depth just adds to the complexity of this art. 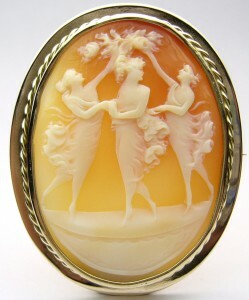 The Three Graces depicted is this cameo are said to represent beauty, charm and joy. It’s a popular theme that has been recreated over many centuries in paintings, statues and carvings like this. 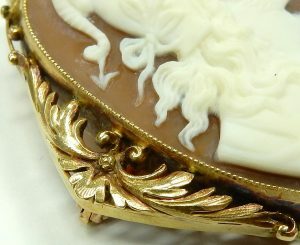 A hand made 10 karat yellow gold rope edged bezel secures the natural shell cameo measuring 56.0mm x 46.5mm. A standard locking pin hinge clasp secures the 12.8 gram brooch. Estate priced at $630.00. Stock #e8482. 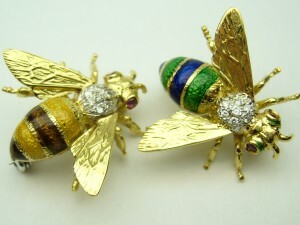 These honey bees brooches look like antiques from the Art Nouveau design period from the early 1900s. After we had a close look at them we decided they are of more modern manufacture because of the use of rhodium, white gold pin/hinge hardware and round brilliant cut diamonds. None of these items were available in the late 1800 to early 1900s. Sometimes we must practice a little jewellery forensics to determine history of the unique items we receive. 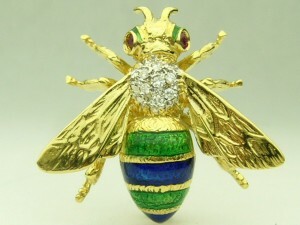 The 18 karat yellow gold bees each weigh over 7 grams and have coloured transparent enamel striped sections on the body and head. Genuine ruby eyes and 6 bead set 0.01 carat diamonds complete the extra decoration. 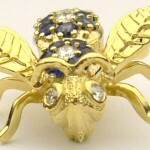 Each bee measures 24mm long and is secured by a white gold pin hinge with safety catch. These cute little bugs are very skillfully made showing great detail and very vivid colour glass enamel work. I have very little history on them except the previous owner indicated they came from Holland. Estate priced at $990.00 each. Stock #e7072. 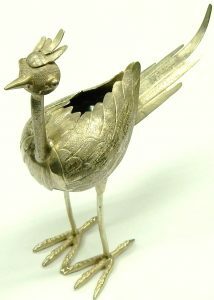 We sure do get some unusual objects at Bill Le Boeuf Jewellers. Take for instance this little gold sword. I’m not exactly sure what it was used for or why the original owner had it made. It’s just about the perfect size for a pirate Barbie or perhaps a swizzle stick for a very important cocktail. It might make a great gift for your favorite bartender. 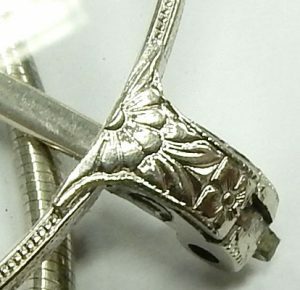 The sword measures 2.25 inches long and weighs 2.2 grams. Estate priced at $122.00. Stock #e8366. For the select crowd who really appreciate fine detail Art Deco jewellery. This is perhaps the best example of the craft to come through in a while. 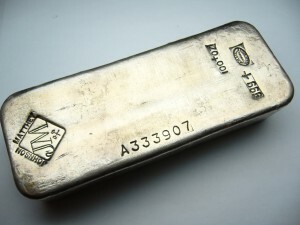 Bar pins were extremely popular in the 1920s and many have survived over the years because they didn’t experience the constant wear a ring from the same time period did. Measuring a very wearable 53mm x 6mm and weighing 4.9 grams the brooch contains one 0.12 carat European cut diamond of VS-FG quality along with 30 tiny diamonds bezel/bead set throughout the pin. Double gallery construction give it a light, delicate look and the mill grain filigree design is comparable to the finest produced. 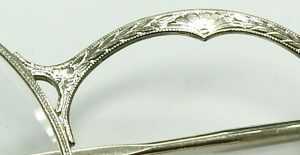 The brooch is secured by a pin hinge with sliding tube safety catch. It’s too bad we can’t acknowledge the maker of this piece as the only identifying mark is an 18k stamp on the clasp. Pushing 100 years old but looking as good as ever this beautiful example of high quality Art Deco jewellery is estate priced at $840.00. Stock #e8196. I can’t believe we have this item. If you have been following our estate section you know how excited I get about really nice high quality pieces. Well the bar has been set to a new level. This is a complete service for 12 (60 pieces) in sterling silver. 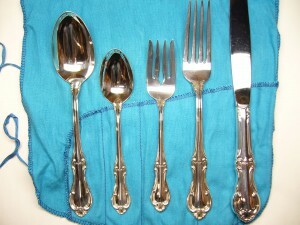 This set was bought new in the 1970’s and only used for special occasions. It is in like new condition with a special blue velvet storage pouch for each set with a silk draw string to bow tie. This is the height of dining sophistication. You will know what I mean if you have ever had ice cream out of a sterling silver spoon. The total weight of the set is over 6.5 pounds. You could never replace this set for the estate price of $5000.00. In over 50 years of selling estate items this is the first time anything like this has been offered. Stock #e6203. 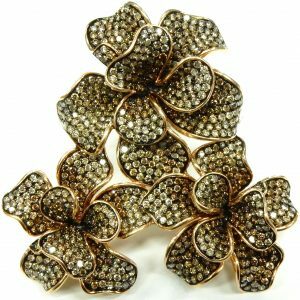 Brooches are becoming popular again and for good reason. Look at the great display and design you can get for $560.00. Brooches offer designers endless possibilities and combinations of materials to experiment with. This floral arrangement inspired piece was constructed from the most subtle mix of 9 karat yellow and rose gold with bright brilliant cut genuine garnet and citrine gems that cover the red to yellow end of the colour spectrum. Both yellow citrines have chips that are invisible without careful scrutiny. The centre concentration of colour is nicely contrasted by the two white pearls that almost go unnoticed. This brooch measures 5.8cm x 2.7cm and is secured by a tight pin hinge with safety clasp. Step out of your jewellery comfort zone and add splash of colour too. Estate priced at $560.00. Stock #e8175. Classic Art Deco design antique bar pin. These little brooches really showcase the jewellers art from almost 100 years ago. They exhibit great detail and lost techniques of craftsmanship. The filigree and mill grain are very time consuming and seldom seen in this kind of detail today. The top of the pin is made from platinum while the gallery and locking clasp mechanism is made of 18 karat white gold. 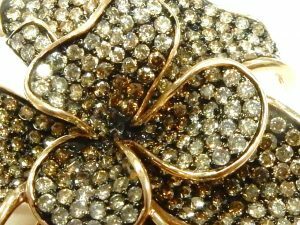 12 small old single cut diamonds and one old European cut diamond (0.10 carat) are set throughout the brooch and all are of good VS-SI-H quality. 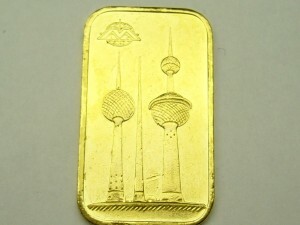 The pin weighs 4.2 grams and measures 6.0 cm in length. Estate priced at $600.00. I’m a sucker for these little stick pins. 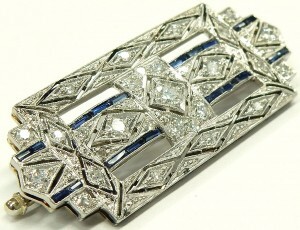 The Art Deco designs are fantastic examples of the craft of the skilled jeweller. This little pin only measures 17mm x 8.5mm but look at all the great details that are incorporated. Beautiful pierced filigree with mill grain decoration. 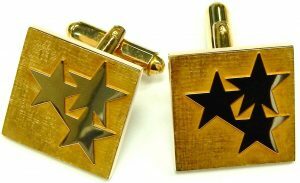 The symmetrical geometric patterns really strike a cord with many jewellery collectors. 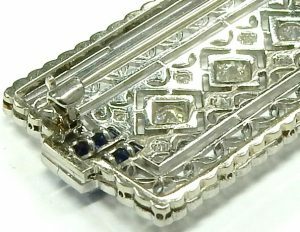 This example is made of 1.5 grams of 14 karat white gold and contains one old mine cut diamond weighing approximately 0.10 carats with two square scissor cut synthetic blue sapphires. 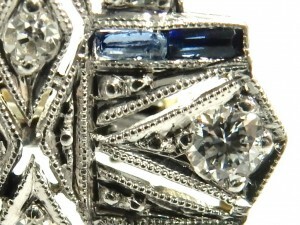 The diamond has a couple small chips along the girdle edge but are not noticeable without magnification. These little Deco stick pins are not all that uncommon but chances are you’ll never see two the same. 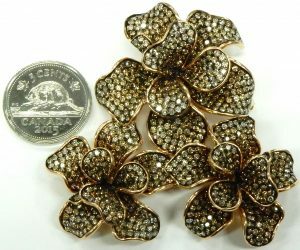 If you like the design but are not much for brooches we could convert this into an attractive brooch for around $50.00 . Estate priced at $147.00. Stock #e7869. 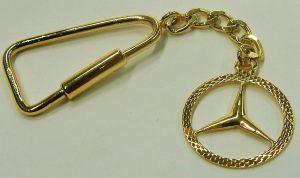 This charm came off a Tiffany bracelet that we sold a few days ago and the purchaser did not need this particular charm. The retail price on this charm from Tiffany’s web site is $105.00. 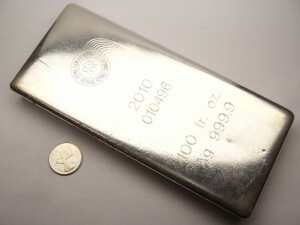 It is made from 5.9 grams of sterling silver and measures about the size of a nickel. 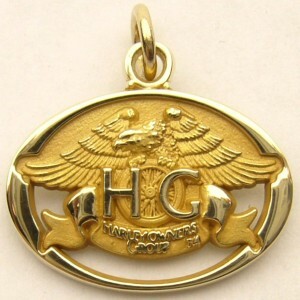 We would be happy to engrave a special message on this item for you. Estate priced at $40.00. Some of the greatest jewellery pieces ever produced have been brooches. They are a blank canvas that doesn’t limit the creativity by adapting the design to fit a finger or the contour of a neckline. Most also have survived quite well because they don’t suffer the abuse a ring does. This is a perfect accessory for this time of year with the yellow, orange citrines and red garnets blending with the 9 karat yellow and rose gold. Tall cattails are a familiar sight in this part of the world in the fall. The 9 karat brooch weighs 9.3 grams and measures 5.9cm in total length. The antique box we received the brooch in adds to the character of the piece. Estate priced at $645.00. Stock #e7692. I can’t think of any other jewellery design company than Tiffany to take rather unusual subject matter like this and somehow make it cute. This 18 karat yellow gold brooch likely dates from the 1970s and is in great condition. The brooch measures 27mm diameter and is quite heavy weighing 17 grams. A cluster if 7 high quality round brilliant cut diamonds 0.50 carats in total weight decorate the piece. 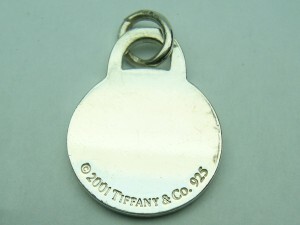 Secured by a double pin locking clasp signed Tiffany and Co. Estate priced at $2100.00. Stock #7429. Just when you think you’ve seen it all something like this shows up. 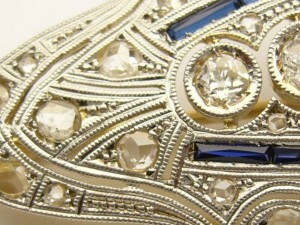 An absolutely one of a kind grey opal and diamond platinum Art Deco brooch. Not only is this one of the biggest opals seen here measuring 22.2mm x 13.2mm x 5.0mm weighing an estimated 8.25 carats. It’s also one of the best with a fantastic play of colour across pretty much the entire stone including the back. The play of colour exhibits virtually every colour including the most hard to find and valuable pinkish red. The platinum brooch weighs 5.8 grams and also contains 20 high quality European cut diamonds totalling 0.50 carat in weight. 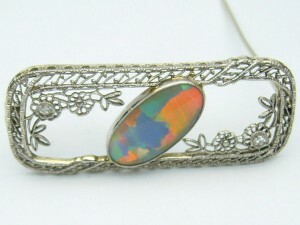 Opals are extremely difficult to photograph. 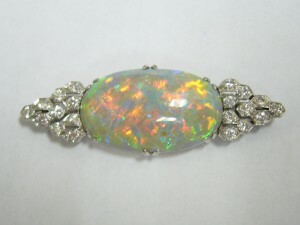 In person the opal shows much more colour than my pictures could ever hope to. Likely made sometime in the 1920s this is yet another great example of beautiful Art Deco Design. Estate priced at $5530.00. Stock #e7695. The oddities and unusual items just keep on coming in. At first glance you may think this is a peridot the birthstone for August or perhaps a green quartz. 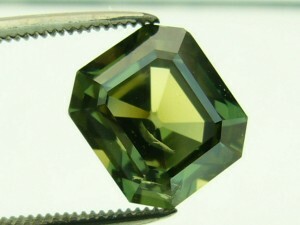 After examining the chiclet sized green gem its true identity of corundum commonly refer to as sapphire was revealed. 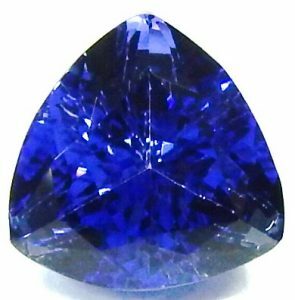 Most sapphires come in various shades of blue but they can also come in many other colours. 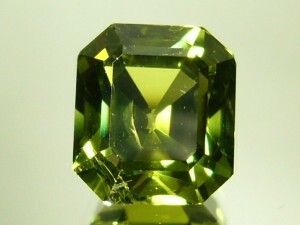 Green is a rather rare colour for sapphire and to find one over 5 carats with a rectangular step cut is very rare. 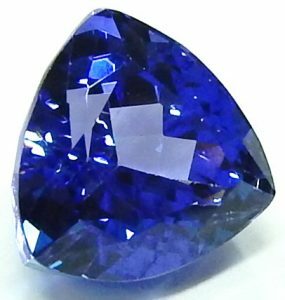 Almost no pricing information is available for larger exotic coloured sapphires like this as they trade hands so infrequently. Measuring 9.68mm x 8.59mm x 6.65mm and weighing just under 5.50 carats. This one is the largest and best quality specimen we have ever had. It would make a great pendant with a few diamonds surrounding it or an interesting alternative to a diamond for an engagement ring. 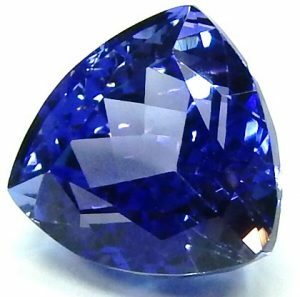 The superior hardness and durability of sapphire make the stone an excellent choice for a ring. Estate priced at $5000.00. Stock #e7566. It seems many watch guys are also pen guys so every once in a while we get a nice pen on trade. 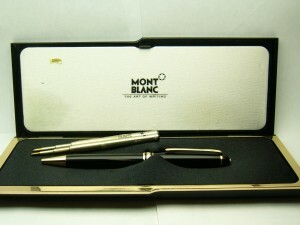 The Mont Blanc ball point pen appears unused. 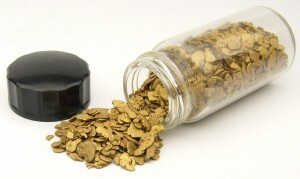 The black resin barrel and cap are scuff and scratch free. Not even a blemish on the gold clip. Complete with original inner/outter box and service guide booklet. 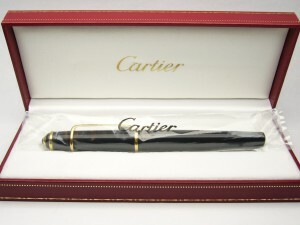 The pen retails for around $400.00, this like new example of estate priced for $235.00. Stock #e7304. Wonderful design platinum brooch from the 1940s. Pieces like this usually don’t survive the generations that have followed the original owners. Most have been taken apart to make engagement rings for baby boomers. This one was expertly hand crafted in over 10 grams of platinum and set with a 1.18 carat round European cut diamond of very good VS2-H quality. The pin was further enhanced with 34 round single, Swiss and brilliant cut small diamonds all of excellent VVS-FG quality equalling approximately 1.00 carats in weight. 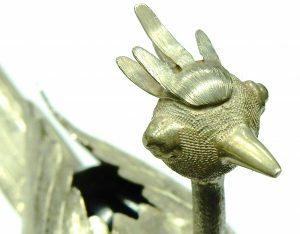 The brooch is secured by a locking pin hinge with safety catch. Estate priced at $7500.00. 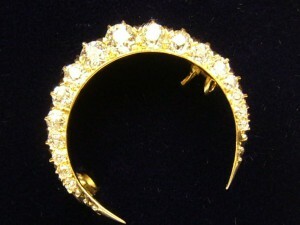 The centre diamond is available alone for $5750.00. 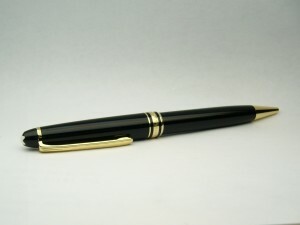 This is the first pen we have ever offered as an estate piece in the 53 years we have been in business. 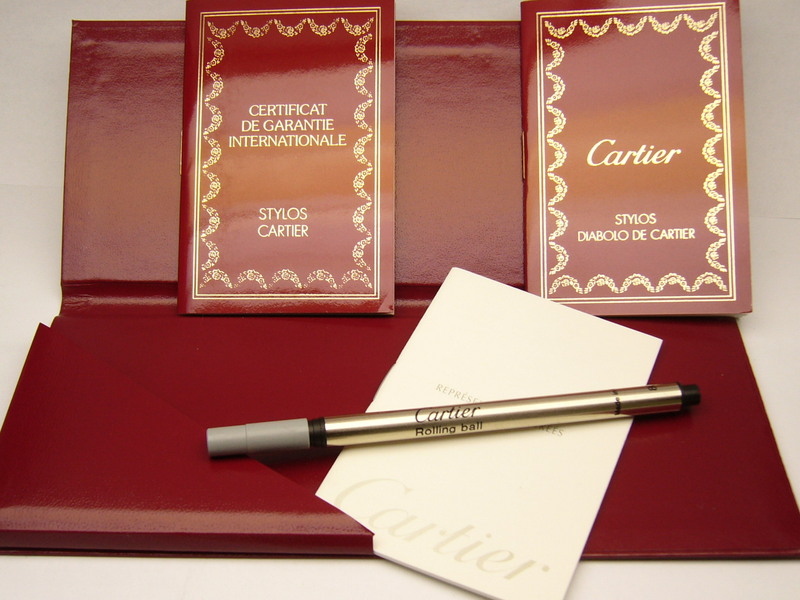 How could I say no when I was offered a brand new Cartier Diabolo roller ball pen. This item is complete with inner/outer boxes, warranty cards, instructions, refill etc. The pen is still sealed in it’s plastic sleeve. 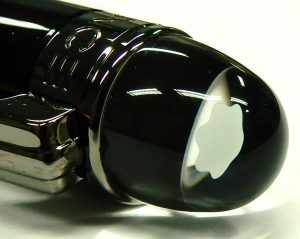 These pens retail at $345.00. This one is offered at $250.00. This was a popular item 120 years ago for the well dressed crowd. 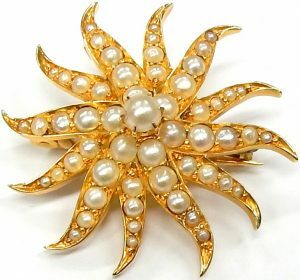 This combination brooch/pendant/pearl enhancer is made from 14 karat yellow gold (9.3 grams) and contains 80 small seed pearls and one old European cut diamond 0.20ct. SI-HI. It measures 41mm diameter. Estate sale priced at $1000.00.